Have you ever tried to read through the Bible in one year? And then something happened – illness, job change, life crisis – and you never finished? I have. Multiple times. But I don’t let setbacks like that keep me from getting into the Word regularly. Because that would be the real failure – to stop altogether. 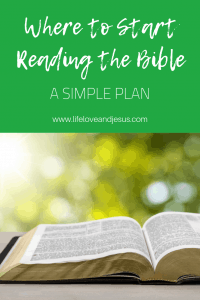 The question at times like that is, “Where do I start reading the Bible?” Often, my plan to read through the Bible is so off-track that I feel like I need a new plan. The answer is surprisingly simple: start anywhere! Just start. However, I will be the first to acknowledge that some books of the Bible are better for starting your Bible reading journey (over!) than others. This year I am not reading through the Bible. I am deliberately reading just one chapter a day and letting the truths of that one chapter soak into me. I started on this journey by reading Psalm 1 on New Year’s Day. In fact, I didn’t plan on this becoming my plan. But that psalm on that day spoke to my heart so intensely that I couldn’t move on in reading more. Reading more had been my initial plan. Instead, I re-read Psalm 1. I prayed through it. I journaled about it. And this slow intake of Scripture became my plan for now (and maybe the entire year). This year – marked as it has been by illness, lots of sleeping, and not keeping up with my to-do list – I need something simple. So, I am alternating reading chapters in Psalms, Proverbs, and the Gospels. Sometimes, I’ll read a psalm on three or four consecutive days before I go back to Proverbs or Luke. Sometimes, I’ll read a couple of chapters in a Gospel on the same day just because the intensity of the storyline is drawing me in and I’m falling in love all over again with Jesus. While it may seem haphazard to some, it is a plan that is meeting me where I am in life right now. And that, my friend, is the kind of plan everyone needs. Just to give you a glimpse here’s what I’ve read the last two weeks, in the order I read them: Luke 19, Proverbs 12, Luke 20, Psalm 30, Psalm 31, Proverbs 13, Luke 21, Psalm 32, Psalm 33, Psalm 34, Luke 22. I also missed 3 days, and I read Psalm 34 twice – it is a great passage of Scripture!! It’s a grace-filled, Word-rich walk through some of my favorite parts of Scripture. And the Lord is meeting me here, where I am. Maybe you need such a plan. Before I continue, however, let me assure you I am all in favor of reading through the Bible systematically. Whether that’s in one year, in 90 days, or over three years. Whether it’s book order, chronologically, or some from both the Old and New Testament every day. Reading through the Bible – getting the full scope and sweep of God’s work in history – is something every believer should do multiple times in his or her life. But there are also seasons when it feels like a chore and something else is necessary. Those seasons are what I’m talking about and living through. Those seasons when you need to slow down and let the Word minister to you. If you’re familiar with Scripture, choosing what to read is easier. If that’s you I strongly encourage you, even in a more relaxed plan like I’m discussing, to read through entire books. Just choosing a chapter here and there will not be as nourishing as getting into a book. 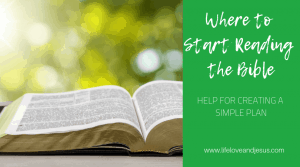 But if you’re just starting out with Scripture, I’d like to help you choose where to start. First, choose a gospel – they’re all great, but I’d suggest either Mark or John to start with. Mark, because it’s the shortest, most fast-paced gospel. John, because it gives us a unique perspective on Jesus as the Son of God. This portion is to introduce you – or re-introduce you – to your God and Savior. Next, choose a portion from Psalms. One Psalm a day is working for me, but when I get to the longer psalms, I may break them into multiple days. Especially Psalm 119! This portion is to prepare you to worship the Lord in prayer and praise. Finally, read something from Proverbs or an Epistle. When I am done with Proverbs, I will be going to the Epistles in my one chapter a day pace and reading through them all. This portion is to give you some guidance on practical application of God’s principles for living righteously. Write down or otherwise record where you read each day. That way if you miss a day or two, you won’t be lost about where to go when you get back into reading. Also, you’ll be able to remember, since you’re skipping through three books, what was the last chapter of each book that you read. I have a Bible Reading Log in the Resource Library that would be perfect for tracking your progress. While you’re tracking what you read, I encourage you to journal about what the Lord is saying to you through these Scripture passages. Journaling might not be something you choose to do every day, but once or twice a week. Whatever you choose, journaling becomes a wonderful record of your spiritual journey. Re-read your entries in a few years, and you’ll have an opportunity to praise the Lord for all He has taught you and brought you through. I wouldn’t feel right ending this post without mentioning that, even in the simplest of plans, all of us will sooner or later fail to be perfect. That’s what we call being human. Starting again after you’ve missed a day, a week, or a month is what we call growing in grace and strength. Don’t let your failures define you – in this arena or any other area of life. Instead, use your setbacks to motivate yourself to keep persevering. The only difference between those who grow strong in their faith and those who don’t is this: the strong ones kept getting back up after falling. You will fall. You will fail. How you respond to those falls defines what your faith will look like a year or ten years from now. And your faith will define what your life looks like. Giving up is easy. Getting up time and again is hard. Choose the hard way, the narrow road.